South Florida has been one of the major locations for recreational boating for decades. There is some debate about who actually coined the phrase “Venice of America” for Fort Lauderdale, but with 165 miles of waterway, it certainly is appropriate. Boating is a year-round passion in Miami-Dade, Monroe, Broward, and Palm Beach Counties, with a combined 165,000 recreational vessels registered. When Spring Break rolls around, that’s usually one of the busiest times for traffic offshore and on the inland waterways. Not unexpectedly, accidents increase. Who Can Help When Someone is hurt in a Florida Boating Accident? The dictionary defines boating as “the use of boats, especially for pleasure,” and certainly sailing out into the deep blue sea or motoring across a lake is both relaxing and fun. People sometimes drop their usual inert tendency to exercise caution when they are boating, and that’s when accidents happen. Boating has increased in popularity across the country and especially in Florida, the number one ranked state for number of boat registrations. As the number of boats grows and the waterways become more congested, the number of accidents and injuries climbs as well. So, what happens when there is a boat accident and someone is injured? Is it the same as a car accident? Is there liability and collision insurance? Who determines who is at fault? Can a regular accident attorney help? These are all excellent questions, but the answers are not necessarily clear-cut. Boating accidents may be investigated by local police, the Florida Fish and Wildlife Conservation Commission (FWC) or the U.S. Coast Guard, depending on the circumstances. Insurance for boating accidents is not the same as for automobiles. There are times when a passenger injured on a boat might be covered by their homeowner’s insurance, but they may not be covered. Jet-skis, wave-runners, and other small and speedy watercraft are growing in popularity and unfortunately so are the accidents. Five people were killed in 2014 personal watercraft accidents, and dozens were injured. Persons operating personal watercraft may or may not carry insurance, so it is advisable to check before riding on one. Different jurisdictions, different laws covering different types of watercraft, and insurance coverages that may have very wide gaps. The Florida Statutes covering “vessels” or all watercraft are mostly located in Chapters 326-328 but the laws are difficult for a non-lawyer to understand. It can be confusing! The entire process covering boating accidents, liability, negligence, and even the possibility of criminal implications is a very specialized area of law that only a handful of attorneys in Florida have chosen as a special area for their practice. 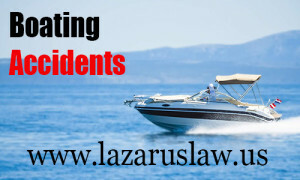 The Law Firm of Lazarus and Lazarus has been helping victims of Florida boating accidents for over 20 years and they are eminently qualified to investigate and then recommend the best course of action for anyone who reaches out to contact them at 954-356-0006.